Arab MPs reacted furiously in July when Israel's parliament approved the legislation, which says Jews have a unique right to national self-determination in the country and puts Hebrew above Arabic as the official language. On Sunday, Mr Netanyahu responded with an Instagram post of his own that referred to the "nation-state" law. "Dear Rotem," he wrote. "Israel is not a state of all its citizens. According to the basic nationality law we passed, Israel is the nation-state of the Jewish people - and only it." "As you wrote, there is no problem with the Arab citizens of Israel. They have equal rights like all of us and the Likud government has invested more in the Arab sector than any other government," he added. According to AFP news agency, Mr Netanyahu later brought up the issue at a cabinet meeting. He called Israel a "Jewish, democratic state" with equal rights, but the "nation state not of all its citizens but only of the Jewish people". What did Gal Gadot say? The Wonder Woman star defended the comments posted by Sela, who is reported to be a close friend. "This isn't a matter of right or left. Jew or Arab. Secular or religious," she told her 28.3m followers on Instagram. "It's a matter of dialogue, of dialogue for peace and equality and of our tolerance of one towards the other." President Reuven Rivlin also appeared to get involved in the debate on Monday. Without mentioning any names, Mr Rivlin condemned what he said were recent "entirely unacceptable remarks about the Arab citizens of Israel". Arab MPs also praised Sela's comments, the Times of Israel reports, including Ayman Odeh who said: "Rotem Sela, we don't know each other but bravo." What's it got to do with the election? 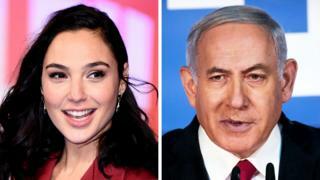 Mr Netanyahu's critics say comments like those made by Ms Regev are part of a bid to court right-wing voters. Likud is facing a serious challenge to its re-election hopes with a rival centrist Blue and White alliance, led by ex-military chief Benny Gantz and ex-Finance Minister Yair Lapid, ahead in the polls. The prime minister has also come under increased pressure since the attorney general announced last month his intention to file corruption charges against him, pending a final hearing that will take place after the election. At the last election four years ago, Mr Netanyahu apologised after warning that "right-wing rule is in danger" because "the Arabs are voting in droves". Israeli Arabs, descendants of the 160,000 Palestinians who remained after the State of Israel was created in 1948, have long complained of being treated as second-class citizens. They say they face discrimination and worse provision than Israeli Jews when it comes to services such as education, health and housing.